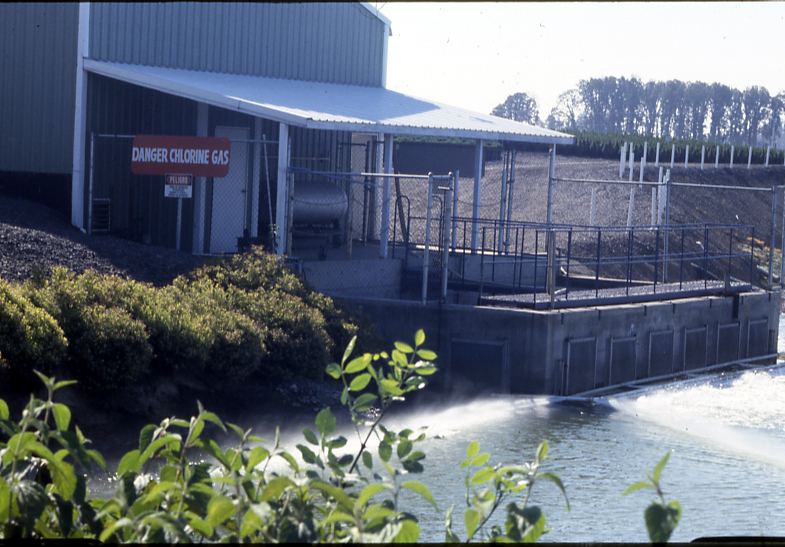 Surface water sources such as rivers, ponds, and reservoirs for storing runoff water are almost always contaminated and should be disinfested before use in irrigation. Runoff water is returned to a reservoir prior to disinfestation treatment. Flood floor irrigation needs to be treated also. Filtration systems: Top Left - Slow Sand tank. Top Right - Fine sand filter. Bottom Left - Rolling paper filter. Bottom Right - Vibrating screen filter. Top Left - Ufer et al. (2008), others - Paul Fisher. Chlorine gas is bubbled through the water, where it combines with the water to form hypochlorous acid (HOCl) and hydrochloric acid (HCl). Oxidizing agents include bromine, chlorine gas, sodium hypochlorite, calcium hypochlorite, chlorine dioxide, ozone, and activated peroxygen. Chloronation systems: Top - Calcium hypochlorite (AccuTab) injector. 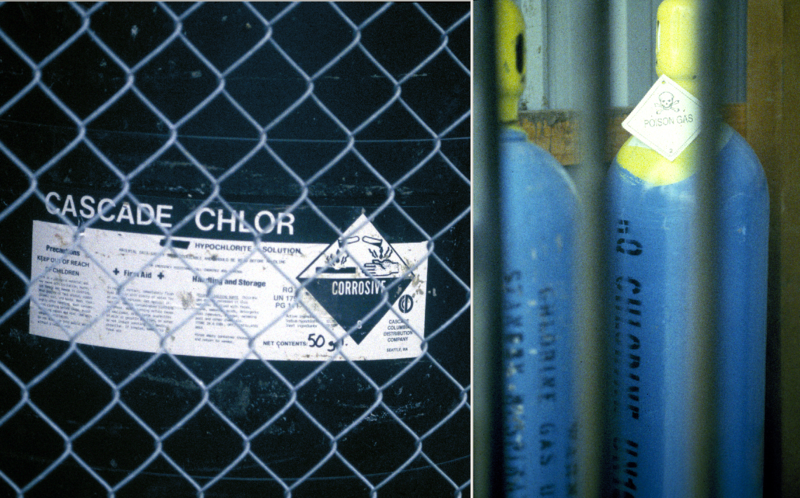 Bottom Left - storage tank with sodium hypochlorite chlorinator. 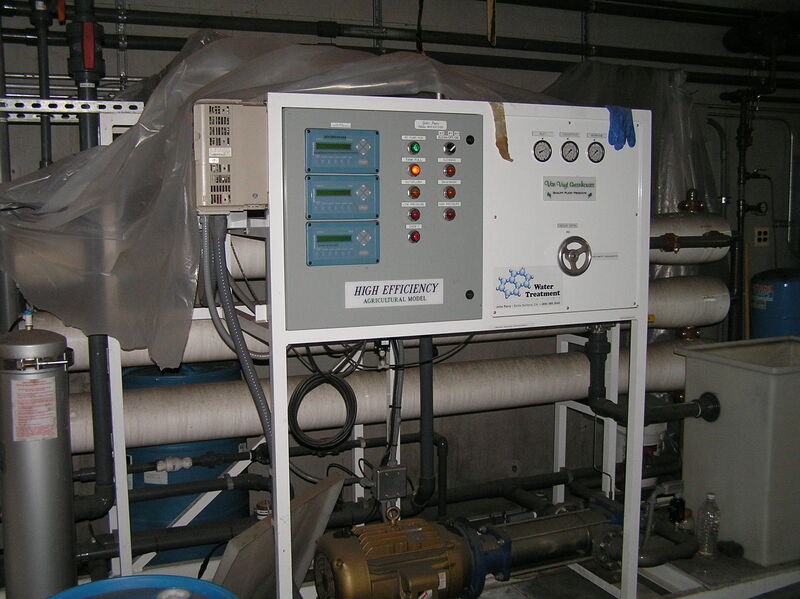 Bottom Right - chlorine dioxide dosing unit. Nursery and greenhouse growers commonly capture runoff water and reuse it for irrigation. This conserves water and prevents the escape of nutrients and pesticides into waterways. However, reservoirs also provide a habitat for waterborne plant pathogens. The most serious of these are the water molds, which look like fungi but require water to complete their life cycles. The most common water molds are Pythium species, which cause damping-off of seedlings and stem cutting rots, and Phytophthora species, which cause root rot, shoot dieback and foliar blight on a wide range of nursery plants. Unless recycled water is disinfested before reuse, irrigation water may become an effective delivery system for these plant pathogens. 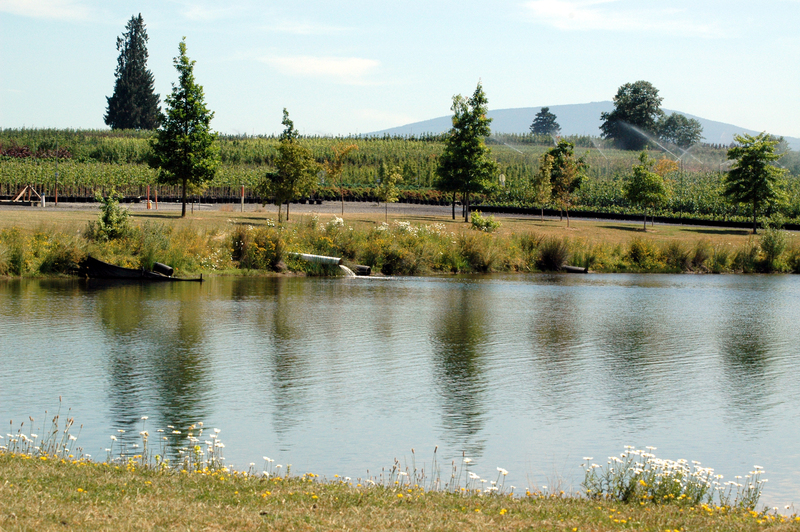 Extensive sampling in nurseries indicates that surface water sources such as rivers, ponds, and reservoirs for storing runoff water are almost always contaminated with Phytophthora and Pythium species and should be disinfested before use in irrigation. Only water from municipal sources or well water are free of these plant pathogens. You should assume that recirculated water is contaminated and disinfest it on a routine basis, or you can test your water at frequent (monthly) intervals and treat only if needed. You can test for the presence of Pythium and Phytophthora by baiting water with rhododendron leaves for seven days and then testing the leaves with field diagnostic ELISA kits. ELISA kits use monoclonal or polyclonal antibodies to detect the pathogens; the same technology used in home pregnancy kits. Kits are available as dipsticks such as the ImmunoStrip (Agdia), or as lateral flow devices such as the Alert LF (Neogen Europe Ltd.). Note that currently available ELISA tests for Phytophthora cross-react with several Pythium species, potentially leading to false positives. For this reason, the ELISA tests are best used to rule out the presence of Phytophthora species. If the Phytophthora test is positive, further testing by a university extension plant pathology lab is advised to make sure that Phytophthora ramorum is not present. Several methods are available for effectively disinfesting irrigation water (Table 1). Water treatment systems differ in installation costs, operating costs, mode of action, space requirements, water volume treated, worker safety, and environmental concerns. No single system is best for all nurseries and a combination of filtration with chemical or ecological treatments is often needed. 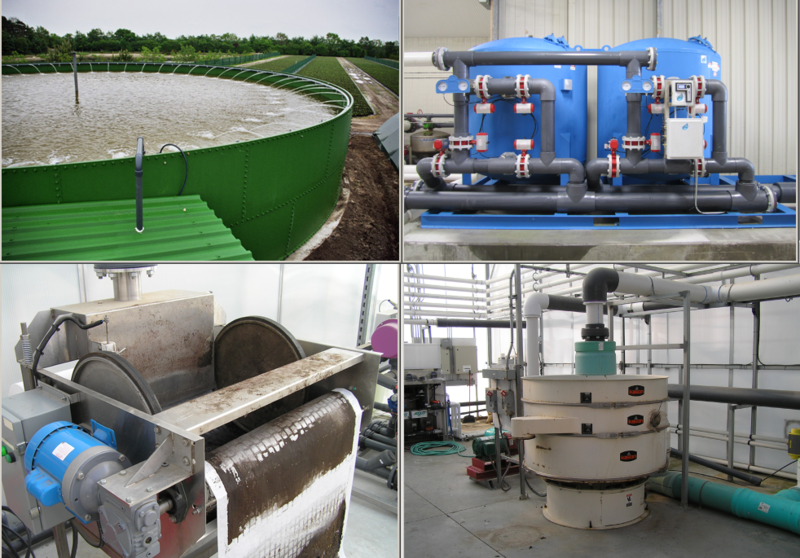 Suspended solids (such as soil and organic matter) in the water reduce the effectiveness of disinfestation treatments. Total suspended solids should ideally be <20 mg/L. Higher amounts of suspended solids increase the risk of plugging emitters and interfere with water disinfestation treatments. Organic materials in the water also deactivate chlorine, so pre-filtration is usually required to remove these materials (remnants of potting media, algae and plant debris) from the water. And finally, effective UV treatment of water to kill waterborne pathogens requires water to be clear. 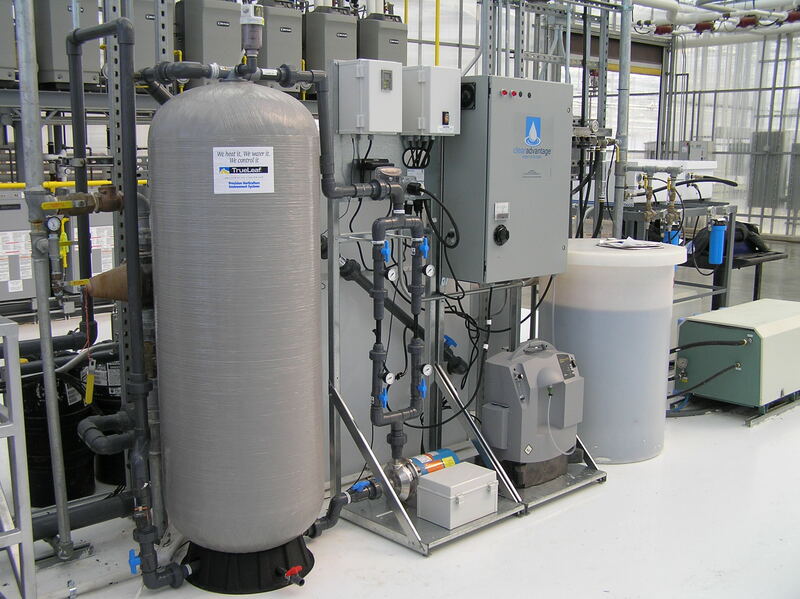 For these reasons, filtration is often the initial step in various water treatment systems. 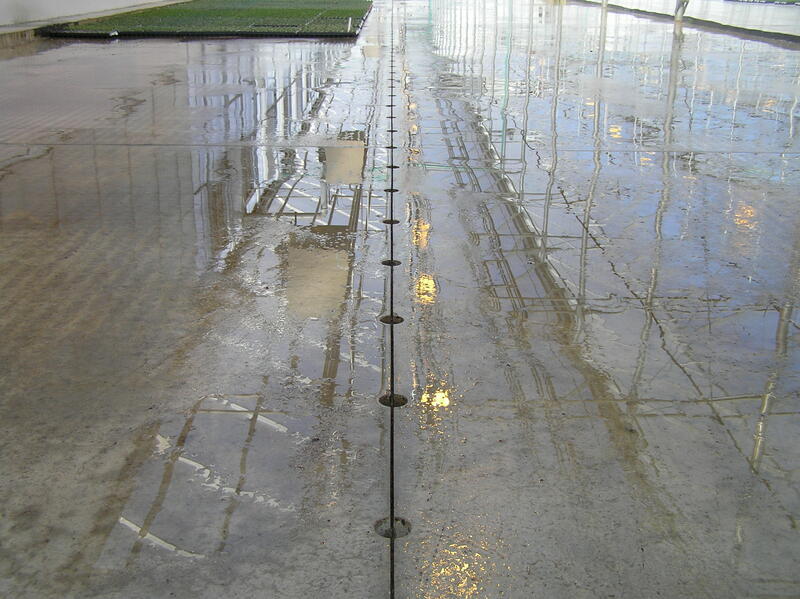 Water chemistry also affects the effectiveness of several disinfestation treatments. For example, the sanitizing activity of chlorine is strongly dependent on pH. For water amended with either calcium hypochlorite or sodium hypochlorite, the optimal pH range is 6.0-7.5. Above pH 7.5, the chlorine would be in the form of hypochlorite, a weak sanitizer. Below pH 7.5, chlorine would be in the form of hypochlorous acid and is 20 to 30 times as effective as hypochlorite. Copper ionization or copper sulfate is also more effective below pH 7. If electrical conductivity (EC) is low (<0.20 mS/cm) then it may be necessary to increase the electrode surface area when ionizing copper. Oxidizing agents react with chemical groups on organic matter, changing the chemical structure of this material. Organic matter includes peat, algae, bacteria, plant debris, and pathogens. Pathogens are killed, after exposure to the oxidizing agent, if it is present at a certain concentration and duration, but since the oxidizing agent is depleted by organic matter in the water, the water needs to be pre-filtered. Oxidizing agents also react with iron and other metals. Oxidizing agents include bromine, chlorine gas, sodium hypochlorite, calcium hypochlorite, chlorine dioxide, ozone, and activated peroxygen. Plant pathogens vary in their susceptibility to the agents listed under “Treatment” in Table 1. Some plant pathogens and types of resistant inoculum structures may require higher rates of oxidizing agents and/or exposure times than those listed. Because all organic matter in the water will absorb and deplete oxidizers, good pre-filtration is essential. Ultraviolet (UV) radiation involves exposure of the water in tubular chambers to UV light, which kills living cells (including pathogens) by disrupting their DNA. Dose, exposure time and turbidity determine effectiveness. Particulates in the water disperse the light, reducing the effectiveness of UV radiation. Pre-filtration of the water is necessary. Copper ionization is the release of copper ions into the water resulting from an electrical charge passed between copper plates. Copper ions are toxic to most pathogens (such as Pythium, Phytophthora, and Xanthomonas) and plants, while the levels used to treat water are well below those that cause plant toxicity. Recent advances in controls produce consistent copper levels and reliable results. Copper is also sometimes delivered as a dissolved salt, such as copper sulfate. Heat treatment is another method of disinfesting water, but it is energy intensive and therefore too costly for treating large volumes. A temperature of 203°F for 30 seconds is sufficient to kill most plant pathogens. The effect is largely independent of water quality. Slow sand filtration is a low technology approach for disinfesting water that has been extremely effective in eliminating Phytophthora from recirculating water in commercial nurseries in Germany.2 A biofilm crust or “Schmutzdecke” develops on the surface of the sand filter. While this layer is important for the functioning of the filter, it must be maintained or the filter can become clogged. Slow sand filtration may not be rapid enough to supply the volume of water during periods of peak demand, requiring filtration and then storage of the clean water in a reservoir. 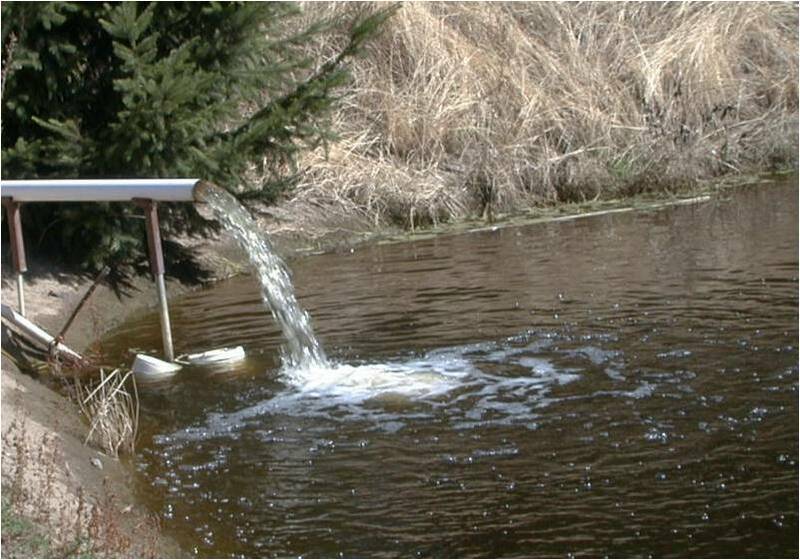 A recent study in a Virginia nursery1 showed that baiting of Phytophthora species declined with increasing distance from the source of water run-off into the reservoir, suggesting that the irrigation pump inlet should be placed as far away as possible from the source of runoff. Bait colonization tended to be greatest when baits were at the water surface or near the bottom of the reservoir, suggesting that placement of the pump inlet at half the depth of the reservoir would result in the least uptake of Phytophthora. An excellent source for learning more about water treatment methods is the educational center of the Water Education Alliance for Horticulture website ( www.watereducationalliance.org ). 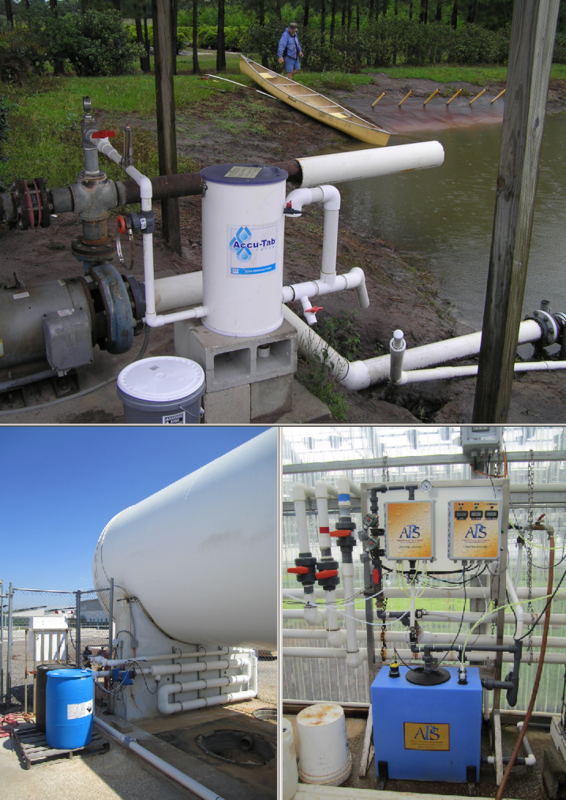 The Alliance is a collaborative program between the University of Florida, other researchers and industry partners that educates growers about water quality and conservation. At the website growers can find key articles and videos about water treatment technologies and monitoring, interactive grower tools and current and previous newsletters. You can also register for upcoming webinars and workshops. 1Ghimire, S. R., Richardson, P. A., Kong, P., Hu, J., Lea-Cox, J. D., Ross, D. S., Moorman, G. W., Hong, C. 2011. Distribution and diversity of Phytophthora species in nursery irrigation reservoir adopting water recycling system during winter months. J. Phytopathol. 159:713-719. 2Ufer, T., Werres, S. K., Posner, M., and Wessels, H.-P. 2008. Filtration to eliminate Phytophthora spp. from recirculating water systems in commercial nurseries. Online. Plant Health Progress doi:10.1094/PHP-2008-0314-01-RS. Tablets or granules are placed in a container with water. The supernatant solution is injected into the irrigation water. Because of low solubility, some time is required for the undissolved tablets or granules to replenish the bromine in the stock solution. Difficult to maintain a constant concentration of bromine over the course of the day, especially with high flow rates. Requires a special injector resistant to corrosive chemicals. 0.5 to 2 ppm free chlorine. Hypochlorite is a weak acid and can be found in solution in two different forms, OCl- and HOCl. Because the HOCl form is much more effective at disinfecting than the OCl- form, the water pH should be controlled, as sanitizing reactions tend to be slower at higher pH. Hazardous gas requires special equipment, ventilation, and handling. As with all chlorine application methods, higher than recommended concentrations can be toxic to plants. Liquid NaOCl solutions (5% to 15% chlorine) are injected directly into irrigation water. Requires a special injector that is resistant to very corrosive chemicals and has a very high injection ratio. Has a limited shelf life. Warm temperatures and sunlight speed up breakdown. Never combine with fertilizers or other chemicals containing ammonium. Granules may be dissolved in water, or tablets can be eroded in a flow-through feeder for more automatic chlorination, at chlorine concentrations up to 10,000ppm, depending on the feeder and operating conditions. Calcium hypochlorite solutions of up to approx. 21% can be prepared, but due to the presence of insoluble materials such as calcium carbonate solutions of above 200 ppm tend to be cloudy. Sediment forms with very concentrated solutions. At less than 100ppm available chlorine there should be no apparent cloudiness or sediment. Dry packet or tablets placed in water, ClO2 solution generated in stock tank. Injected into irrigation lines. Continuous injection of residual concentration of 0.25ppm or less. Twice a year shock treatment at 20 to 50 ppm depending on product. Stock solution should be used within 15 days to minimize loss due to volatilization. Maximum stock concentration of 500 or 3000 ppm depending on product. An electrical arc is used to produce the ozone from bottled or atmospheric oxygen. The ozone is then bubbled through the water. Residual effect from reaction products (peroxides, organic radicals). Breaks up biofilm. 10 grams/hr/m³. Requires professional design based on water analysis. Proper design prevents ozone from escaping into the atmosphere in hazardous concentrations. A stabilized H2O2 and peracetic/peroxyacetic acid solution that is injected directly into irrigation water. Peroxyacetic acid is a more effective biocide than H2O2 alone. Requires a special injector that is resistant to very corrosive chemicals and has a very high injection ratio, or the material must be diluted before injection. Water is exposed to high doses of UV light in tubular chambers. Most common are low-pressure mercury vapor lamps with a wavelength of 254 nm, close to the optimum range for killing pathogens. 50 mJ/cm2 eliminates most pathogens. No residual effect on pathogens downstream of treatment. The effectiveness of the lamp decreases with age. Any particulate matter in the water will disperse the light, making the application of UV radiation less effective. Good pre-filtration is essential. Often used with other disinfecting material to get some residual effect. An electrical charge is passed between copper bars or plates, releasing copper ions into the water. 0.5 to 1 ppm Cu for pathogens. 1 to 2 ppm for algae and biofilm. Less effective if water pH is above 7.5. Choose a system, which actively controls copper output according to flow and EC. Applied copper concentrations are within US drinking water standards and a fraction of plant toxicity levels. Water is heated to specific temperature, and waste heat is recovered to pre-heat incoming water. An example treatment is 203ºF for 30 sec. No residual effect on pathogens downstream of treatment. High-energy use makes it expensive for large flow. To prevent scaling of heat exchangers from hard water, pH needs to be reduced to 4.5, then raised again as needed for irrigation. Best for low flow – high sanitation applications. Water moves passively through sand bed that supports a biologically active layer (“Schmutzdecke” or biofilm crust) on the filter surface. Clean, filtered water is stored in a covered reservoir until use. An example rate of filtration is 30-90 m3/hr. A filter bed area of 260 m2 and 1 m deep can yield approximately 40,000 m3 filtered water/mo. While the biofilm crust or “Schmutzdecke” is important for the functioning of the filter, it must be maintained by periodic raking or the filter can become clogged. Slow sand filtration may not be rapid enough to supply the volume of water during periods of peak irrigation demand. Space limitations may also limit the size of the sand filter and the volume of water that can be treated. AModified by J. Parke, Oregon State University with permission from Fisher, P. (ed.) 2009. Water Treatment for Pathogens and Algae.Water Education Alliance for Horticulture. 57 pp. 1Desired concentration depends on the application (e.g. shock treatment versus continuous treatment of clean water, and the specific pathogens targeted). See product label and manufacturer’s instructions for your application. 2All the methods mentioned above are non-specific and will react with any type of organic matter, whether it is a pathogen, algae, or a particle of peat. In all cases, the cleaner the water is before the application, the more effective the disinfection method is at removing pathogens. 3Bromine, chlorine products, ozone, peroxyacetic acid, and hydrogen peroxide are strong oxidizing agents. Metal micronutrients (copper, iron, manganese, and zinc) are easily oxidized (particularly iron). It is likely that long-term exposure (greater than 20 minutes) of metal micronutrients to these oxidizing agents will decrease their solubility. Chelated micronutrients should be only slightly less affected than sulfates. 4Ultraviolet radiation is a photo-oxidizing agent. Research by Cornell University on photo-oxidation of iron in fertilizer solutions indicates that the greater the light exposure, the less iron that will remain in solution. 5Quaternary ammonium compounds such as Green-Shield, Physan 20, or Triathlon are listed for disinfection of walkways, benches, tools, flats, etc., but are not for use with irrigation water. 6Liquid hydrogen peroxide/hydrogen dioxide (H2O2) solutions (35% to 50% H2O2) are not EPA-registered for water treatment in greenhouses, and are less effective and stable compared with registered activated peroxygen products.